The following three selections have been moved from their original locations in the Homages pages. 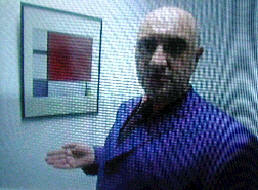 A bumper addition by email from E Ferrucci, shown right. It might take me some time to track those down. The Partridge Family should be here too - I've had a model bus for many years. 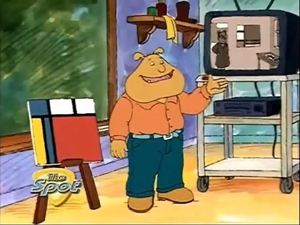 In the PBS Arthur episode Binky Barnes Art Expert they have a Mondrian display. 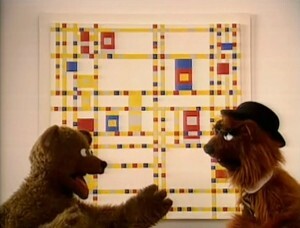 In Sesame Street episode Bears are showing Boogie Woogie Mondrian. 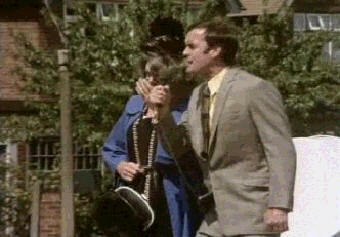 In the Monkees ep a la Mode episode they have a Mondrian Style picture. Not much of a Mondrian and, apart from the structure, far too much green. source - the entry in the full wiki describes it as "Papa and Baby Bear discussing Broadway Boogie Woogie". Homer becomes a conceptual artist, creating striking "outsider art" that catches the eye of Astrid Weller, a beautiful Springfield art dealer. 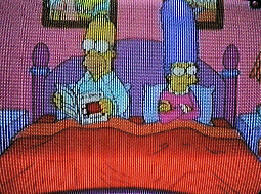 Astrid arranges for Homer to have his own show, but when the Springfield elite gather for the opening, many are disappointed by his work. Homer decides that he must create something truly groundbreaking, so he floods the entire town, turning Springfield into an American Venice. 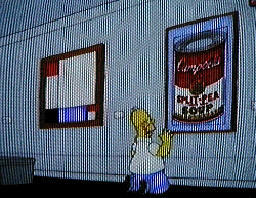 His piece is a hit and everyone, including artist Jasper Johns, voices their approval. 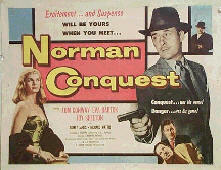 Guest Stars: Isabella Rossellini as Astrid Weller; Jasper Johns as himself. 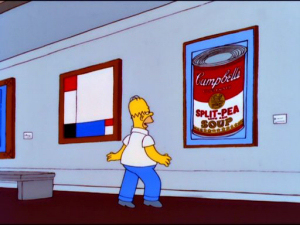 And in September 2010 a much better image from The Wars of the Simpsons, which includes many other art references. PM also got a mention in Python - I think it is the sketch after Arthur two-sheds Jackson. Here's an excerpt and I'll try for a frame one day. Well something certainly is happening here at Tolworth roundabout, David. I can now see Picasso, he's cycling down very hard towards the roundabout, he's about 75-50 yards away and I can now see his painting... it's an abstract... I can see some blue some purple and some little black oval shapes... I think I can see... A Pepperpot comes up and nudges him. Pepperpot That's not Picasso - that's Kandinsky. Good lord, you're right. It's Kandinsky. Wassily Kandinsky, and who's this here with him? It's Braque. Georges Braque, the Cubist, painting a bird in flight over a cornfield and going very fast down the hill towards Kingston and... (cylists pass in front of him) Piet Mondrian - just behind, Piet Mondrian the Neo-Plasticist, and then a gap, then the main bunch, here they come, Chagall, Max Ernst, Miro, Dufy, Ben Nicholson, Jackson Pollock and Bernard Buffet making a break on the outside here, Brancusi's going with him, so is Gericault, Ferdinand Leger, Delaunay, De Kooning, Kokoschka's dropping back here by the look of it, and so's Paul Klee dropping back a bit and, right at the back of this group, our very own Kurt Schwitters. The picture of Mr Cleese commenting on the race was kindly provided by Damian whose astonishingly fine Monty Python site is no more (or at least is no longer where it was). An alternative version found Oct 2011, not as good, but more detail. The Literature and Media section was getting rather diverse, hence a reorganisation August 2002.